« WordPress 3.4 – What’s new? 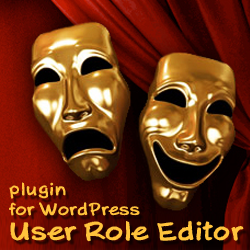 User Role Editor WordPress plugin version 3.7 is published at June 23rd, 2012. What’s new? – ‘Select All’, ‘Unselect All’, ‘Inverse’ buttons were added to the from for more convenient capabilities management while role editing. – Role and capability name could be started from digit, and underscore ‘_’ character. Hyphen ‘-‘ character could be included into such name too. – Old versions used ‘edit_users’ capability to check if show/hide ‘User Role Editor’ menu item under ‘Users’ menu. Starting from version 3.7 ‘administrator’ role is checked. Existed inconsistency, when non-admin user with ‘edit_users’ capability saws ‘User Role Editor’ menu, but got ‘Only Administrator is allowed to use User Role Editor’ error message, was removed. – Bug fix: if you work with WordPress admin via https, URE will use https instead of http, as it made in older versions. As new text was added to plugin main form, translations for all languages wait for updates. Former and new translators are welcome! This entry was posted on Saturday, June 23rd, 2012 at 23:24	and is filed under ShinePHP plugins news, WordPress. You can follow any responses to this entry through the RSS 2.0 feed. You can skip to the end and leave a response. Pinging is currently not allowed.